We picked an accent tile for the kitchen! So stick with me here for a minute. Today I was talking about a coworker who is amazing. She has this quiet Clint Eastwood strength that makes people sort of lean in to listen to her because she isn’t a loud talker. I think there is something to be said for quiet simplicity. Not usually my style but maybe I’m growing as a person. It may be all that time I spend in the dirt. It just doesn’t work. The plaid is gorgeous but it felt like tumbled stone in person and it just didn’t feel like “us” at all. Gary and I are nothing if not a very specific taste. We clearly aren’t tumbled/natural/honed marble. We are a little too glamourous for something so… flat? That’s the worst when you are in love with something and then you see it in person and it is disappointing and awful. Like going to a Mariah Carey concert post-2003. And we came to the less-than shocking conclusion that we don’t need an accent tile. We’ve decided to just use the marble and keep it simple. Which is so not our style. As this project has evolved we’ve really learned that in some cases more is just more. The countertops went in on Monday and they’ve really transformed the space. It doesn’t need anything showy and over the top. It’s just fine on its own and it is appropriate for something as fabulous as Gaye Gardens. It doesn’t need plaid or $700 a square foot tac and ink art glass flowers. Plus, marble wainscoting isn’t exactly subtle. You knew I’d get something excessive in there! Now we just need to install 400 pounds of marble and we are all set! 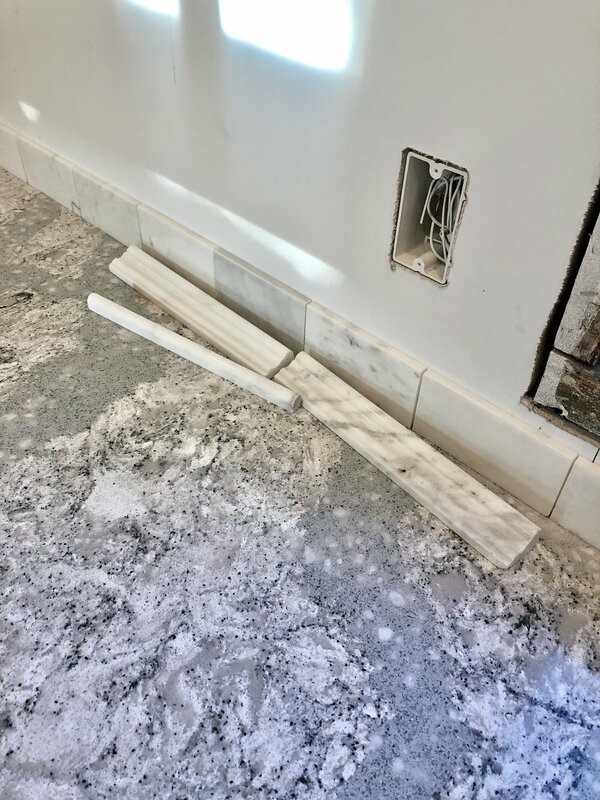 Our not-so-white White Kitchen Finds a Backsplash!